This page covers Pedometers basics, best Pedometers manufacturers with features and benefits or advantages of Pedometers. • The instrument used by walker or runner in order to estimate distance travelled by counting number of steps. This is from the fact that distance is equivalent to multiplication of number of steps with step length. • Pedometer usually comes in the form of a watch which records foot steps of a person. • This electronic or electro-mechanical device counts steps based on detection of motion of hands or hips. It usually comes with lithium battery. • Typically 30 minutes of walk is equivalent to approx. 3000 to 4000 steps as estimated by pedometer. • Some of the best pedometers deliver results with accuracy of about +/- 5 %. • Some of the pedometers use GPS receiver in order to measure distance travelled. • Modern pedometer watches provide more data analysis for users including sleep tracking, heart rate monitoring and more. • It is widely used by sports and fitness enthusiasts as well as regular walkers. 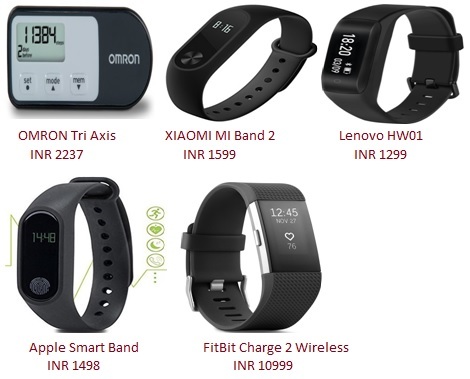 The figure-1 depicts some of the best pedometers manufacturers available in the market. Following table mentions features of these respective pedometers. • It has 4 activity modes viz. aerobic steps, tracks steps, distance travelled and calories burned. • It has capacity to store 7 days of information. • It gets reset automatically every day. • It has OLED display. • It is suitable for bluetooth 4.0, android 4.4 or iOS 7.0 and above versions. • It provides time, distance, steps, calories, battery status and heart rate measurements. • It functions as pedometer and also provides measurement of calories burned and sleep monitoring. • Compatible with android and iOS devices. • It has 0.69 inch OLED display. • It provides heart rate monitoring, sleep tracking, measurement of calories & distance and also acts as pedometer. • Call, text and calender notifications are also available on OLED display. Following are the benefits or advantages of Pedometers. ➨They are easy to use by wearing on wrist or hip. ➨They are inexpensive and non-invasive. ➨They are used to measure common activity e.g. walking at schools and workplace as well as regular walkers. ➨Usually pedometers provide measurement of distance travelled on foot. Modern pedometers also provide measurement of energy expended and time. They also provide heart rate monitoring. ➨10,000 steps per day is recommended by most of the pedometers.